Week 1 is done and dusted, and we have a new tower champion. Here’s what went down! 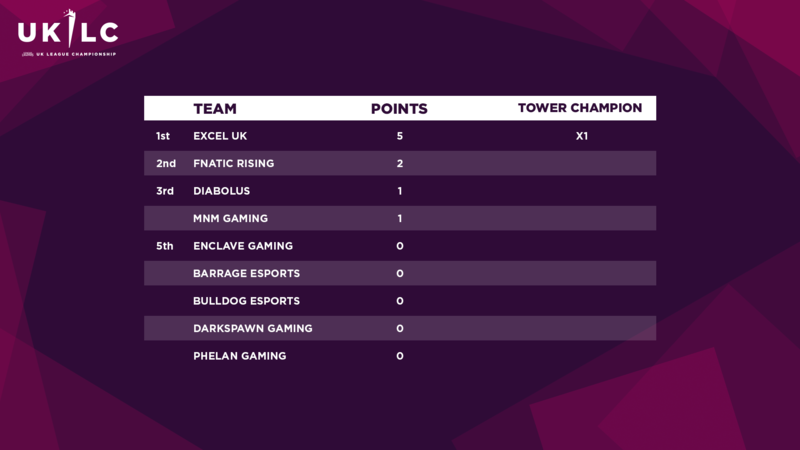 It was a week of heroics for the undefeated Excel UK, as they made their way through a feisty Phelan, a daunting Diabolus, a formidable Fnatic, and finally an excellent Enclave side, who showed that they deserved their starting spot atop the UK League Championship tower. 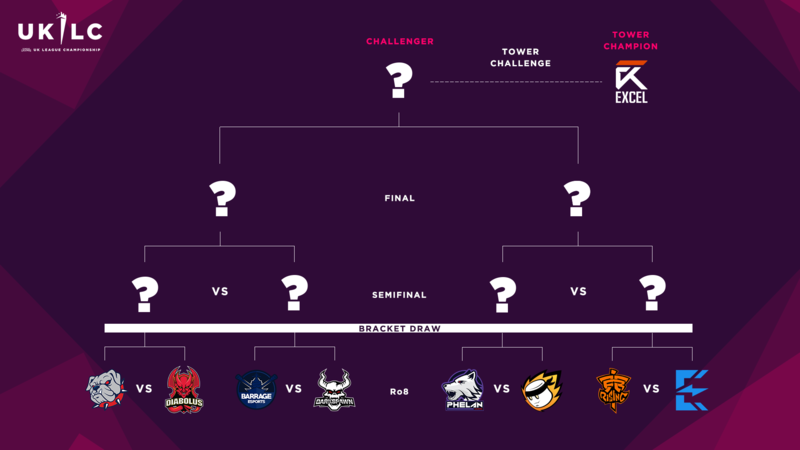 Fans could’ve been forgiven for expecting a one-sided stomp in the first game of the UKLC, with the inexperienced roster of DarkSpawn Gaming coming up against the league’s titans, Fnatic Rising. However, the first blood drawn in the tournament’s history came at the hands of DarkSpawn’s PFI. The jungler showcased some squeaky clean Lee Sin play as his side held their own for much of the game. 🎥The very first kill in #UKLC history is secured at the hands of @PFI. @TeamDarkSpawn, you should be proud! Eventually, Fnatic won out, as their superior teamfighting proved too strong. A similar scenario played out in the second game of the day, as Excel UK overcame Phelan Gaming—despite Eragon doing his best to cause mischief in the side lanes on Urgot. It was also the first time that Excel’s Mystiques got his hands on Thresh, with some eagle-eyed hooks foreshadowing what was to come for the rest of the week. 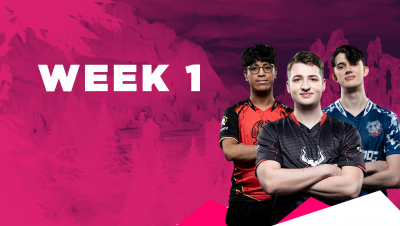 MnM Gaming had been hailed as potential frontrunners to challenge the LEC teams before the first week, and their talented squad lived up to its billing in their match versus Bulldog Esports. Bulldog’s dive bot was turned around by a great roam from Chibs, and from then on it seemed MnM were a step ahead of Bulldogs for the rest of the game, despite Kalwerd’s Zoe putting out obscene damage. But if that game seemed action-packed, it was nothing compared to Diabolus’s battle against Barrage Esports. 🎥 We’re seeing one close match unfold before us as both teams battle it out, but @DiabolusEsports has taken a slight advantage over @Barrage thanks to this redeeming teamfight! Despite getting solokilled by Artorias’s Shen, Kerberos came back in style to have a huge presence in teamfights, helping his team secure no less than four dragons on the way to victory. With 29 total kills in under 32 minutes, the final Round of 8 fixture was a bloodbath. Diabolus looked well-poised to upset Excel UK in the first semifinal of the day. But when they thought they could contest a Dragon after picking off Send0o, Exile’s Ryze showed them just how wrong they were. 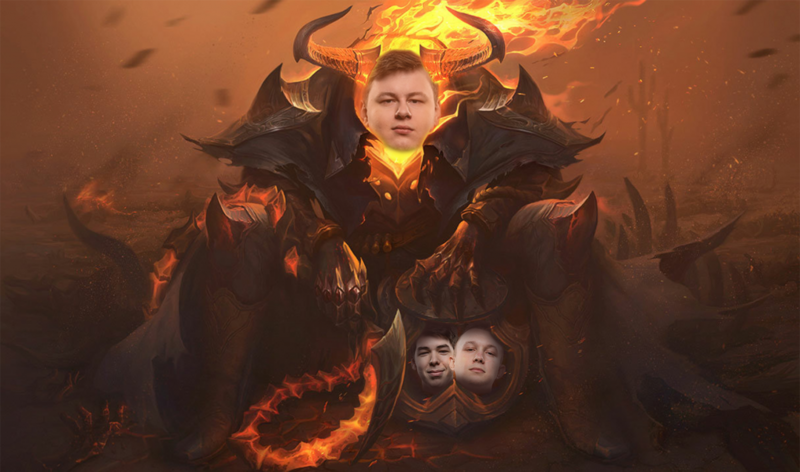 The punishment was severe, as Excel pushed their advantage to take a Baron and two inhibitors, lining themselves up for a decisive finish. Not to be outdone, Fnatic Rising confidently pushed ahead of MnM in the next semifinal, setting up a Rift Herald play at just 11 minutes. But they were left with egg on their face when MnM jungler Noltey nicked the buff with a drive-by steal on Olaf, somehow getting out alive. 🎥 That has to be the closest flash we’ve ever seen, @Nolteylol! The steal proved not to be a catalyst for a MnM win, however, as their 1-3-1 setup was thwarted by well-timed Fnatic engages. 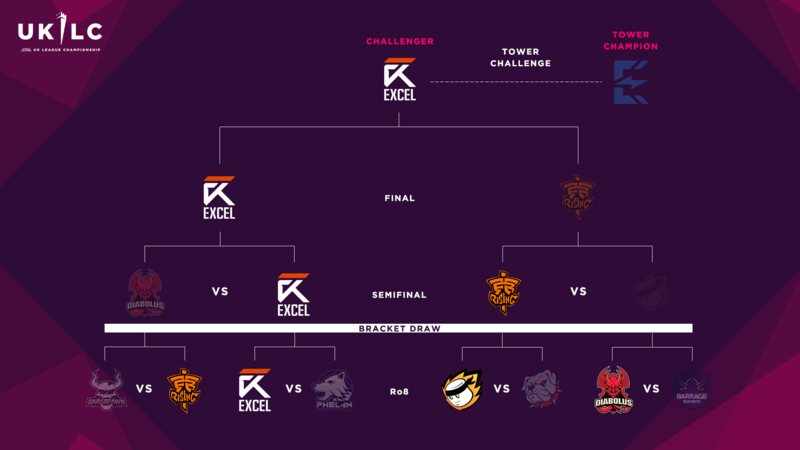 Their victory set us up for a deliciously appealing LEC grudge match in the final of the bracket, as Excel and Fnatic prepared to face off for a shot at Enclave’s tower spot. It was a match that looked to be going Fnatic’s way, as the team was pushing for a second inhibitor at the 33-minute mark with a decent 5k gold lead. But Mystiques was back on his Thresh, and quickly proved that he was simply unplayable on the champion. Once he threaded the needle to land a hook onto xMatty’s Ezreal, Excel stole a clean ace against the run of play, as Innaxe impeccably cleaned up the teamfight. 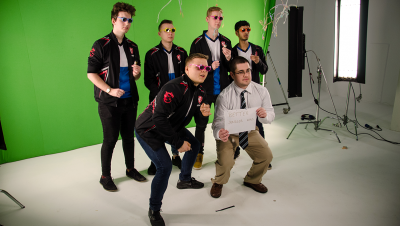 Forget Take That, @EXCEL just had the comeback of the century! Everything was on the line for the last game of the day: our first tower challenge. 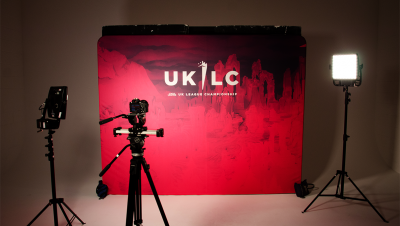 Wysek opted for a surprising Kindred pick in Enclave’s inaugural UKLC game, and he threatened to snowball the game out of control in the opening minutes. Who held him back from that feat? Why, Mystiques’ Thresh, of course. His roams were key in stopping Excel from bleeding too many kills early on, though he couldn’t prevent Enclave from executing an impressive dive bot lane. 🎥 Looks like @EnclaveGamingUK is not giving up their tower spot easily, specially with teamfights like that! But while the teams traded kills cleanly, neither pulled ahead in the objective game. At least, that was true until 25 minutes in, when a mid lane brawl was dominated by Excel, ending in a clean ace and a Baron take. With the bit between their teeth, Excel could not be stopped from pushing their advantage through top lane all the way through Enclave’s base and to their Nexus. With Excel sitting atop the tower, they enjoy the lion’s share of the points tally from the first week of action. Fnatic are closest behind in second place, while Enclave are left empty-handed as they didn’t secure a win, and will have to fight their way back. They have the opportunity to make a statement by doing so next week, as they will face no other than Fnatic themselves! There’s plenty of tantalising prospects lined up for the next games, and with the majority of teams still looking to get on the board, there’s bound to be some fiery contests. Make sure you’re ready by following our channel at twitch.tv/lvpuk. And stay tuned to our Facebook, Twitter, and Instagram for more updates and announcements as all the season’s drama unfolds!